Icelandic Met Office has issued a warning about increased risk of glacier flood from Múlakvísl that comes from Mýrdalsjökull glacier (the glacier on top of Katla volcano). Upon checking reports about increased smell and detecting higher conductivity on sensors, police in the area have confirmed with Icelandic Met Office that unusual high amount of water is in the river at the moment. Currently conductivity in Múlakvísl is 290μS/cm and is stable at the moment. This suggest that a cauldron is about to empty it self of melt water and resulting in a glacier flood. It is possible to monitor conditions in Múlakvísl here on Icelandic Met Office website. I will update this article as needed. This entry was posted in Glacier flood, Katla / Mýrdalsjökull, Monitoring, Volcano. Bookmark the permalink. Perhaps the volcanic activity is the main reason behind this. But it’s also worth noting that it has been very warm in Iceland lately. This has a big effect on the glacial melting and runoff, right? How do the factors correlate? I don’t know how summer melt and the cauldron interact. There is more hydrothermal water in the glacier river then normal so this is not top level melt water that is flowing into Múlakvísl now. Two pulses of something rumbling in the Katla caldera, from the looks of it. Flash flood? It’s either that, or deep magmatic earthquakes/harmonic tremor. 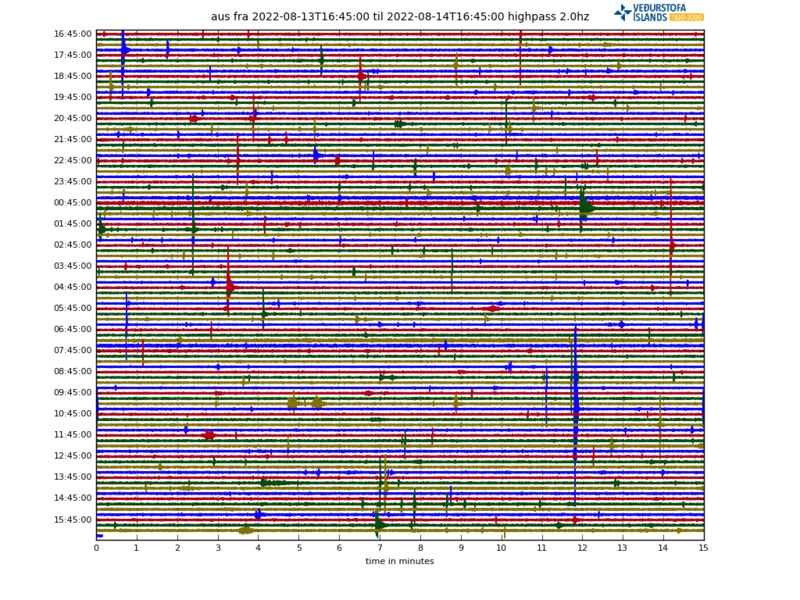 It seems to affect the red frequency span in the tremor plot(s). This is interesting event. It’s not a earthquake. Might be a pulse due to the cauldron is breaking and the glacier flood starting or this is a pulse due to magma movements inside Katla volcano. The earlier pulse is smaller is less visible. That increases the chance that pulse of being something else (noise?). I read an article recently that dark algae has been forming on Greenland’s glaciers making them aside more sunlight and increase melt consequently. I don’t know if that applies to Iceland glaciers. Since I don’t think Greenland and Iceland glaciers are the same type. There is difference between the two and that’s about all I know. I agree that warm weather is melting the glaciers, but that is on the surface and can’t (I think) cause a dramatic flood like a jökulhlaup. Volcanic activity is a better suspect, also bearing in mind the risen conductivity and high sulphur odor in Mulakvísl river. Thanks for clearing it out, Henk. 🙂 I figured that surface meltwater would add to cauldrons in some cases. But also, Katla has typically been at its most active during the warmer months of the year (how far back, I don’t know?). So it is easy to imagine air temperature being a factor in the “chain of events” leading to (for example) a jökulhlaup. Here is a video sequence I made for the Fagradalsfjalli swarm.